Constructed in 1987 and completely refurnished and redecorated in recent years, #109 Defender in Schooner Bay is comfortable and attractive with granite counters, modern cabinetry, new furnishings including complete entertainment center with 50 inch 4k Samsung Smart TV, stereo sound system (with Bluetooth to stream from your device), Hi-Def cable, CD and DVD players and Apple TV plus split system central A/C in all rooms. Located just outside of Christiansted, the property offers superb convenience to shopping, beaches, water sports, and restaurants (among the best in the Caribbean). St. Croix's weather is perfect year around and the beaches and reefs are among the most beautiful in the world. Schooner Bay is conveniently located in Gallows Bay, near Christiansted, on St. Croix, USVI. The entire island can be easily accessed by car or jeep; we will be pleased to assist you with your auto needs. 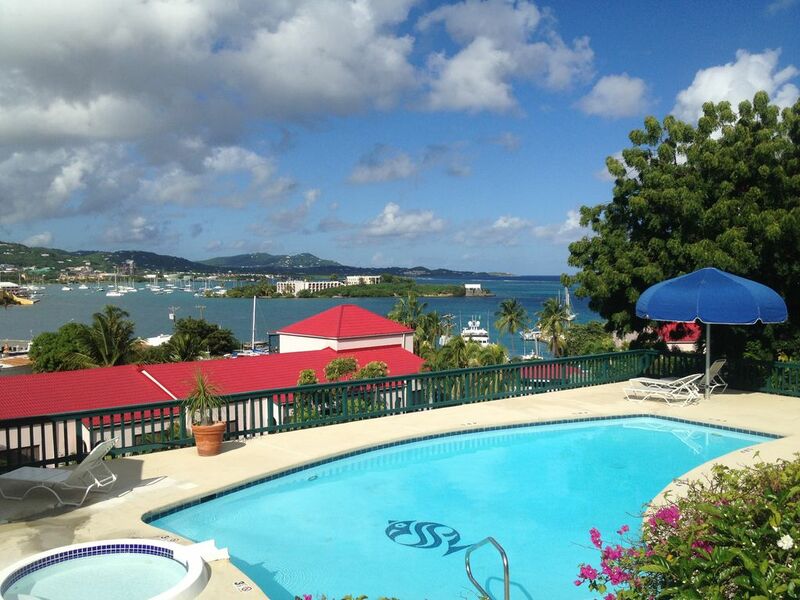 The Westside (Harbor View) pool at Schooner Bay offers a panoramic view of Christiansted Harbor and the reefs on the sea. The Eastside (Sea View)pool offers a beautiful sea view. The villa features a very comfortable tropical style glass and white rattan motif. A comfortably furnished 30' Gallery provides a view through the masts of the boats in the marina to the town, harbor and sea. #109 Defender in Schooner Bay is spacious and can accommodate up to 5 guests. The unit features a fully equipped kitchen, the entertainment center described above and fast broadband internet service. Ann and Tom live in Richboro, PA, in Bucks County, which is just north of Philadelphia. Ann is a Registered Nurse and is a retired school nurse. Tom is involved with the family businesses which include an outdoor swim club, a Halloween entertainment business, and a small marketing firm. One of the marketing firm's projects is the popular VisitStCroix web site. Tom holds an MBA degree, is a former banking executive and military officer and is active in veterans affairs. St. Croix is the perfect place to be laid back and relax. It's unique combination of culture, history and the perfect tropical setting are unsurpassed in the Caribbean. Under the US flag, there is less stress coming and going than foreign islands. Plus you have the convenience of the US Post office and US banks and the protection of US laws. Perhaps the greatest benefit is the weather- perfect year around. Average 12 month daytime high is 85-88 degrees. Average nighttime low is 74-78 degrees. Centrally located, close to Christiansted town with its array of waterfront shops, restaurants and historical sites. Plus we're close to great beaches such as the Buccaneer, Shoys and Tamarind Reef. toilet, shower, Large ceramic tiled walk in shower with window to outside. View is picturesque through the masts of yachts in St. Croix Marina toward historic Christiansted Harbor and the sea. Property is situated above historic Christiansted Harbor- one of the most picturesque harbors in the Caribbean and within a short walk to historic Christiansted town with its shops and restaurants. Equipped with 50 inch 4K Smart TV, complete entertainment center with Stereo CD, DVD, etc. Glass top dining table with seating for 4. Seats 2 at counter. Variety of classic rock, country, classical genres. 35 ft long outdoor gallery overlooks marina. Gallery furnished with high quality Tropitone brand outdoor strap furniture including two chaise lounges, 42 in table and 4 chairs. Two beautiful swimming pools on property. One with a beautiful view to historic Christiansted Harbor; the second with a view east toward Altoona lagoon. Ceiling fans and split system central a/c in every room. Complete entertainment center with 50 inch Vizeo 4K Smart TV, WiFi, Sony Stereo receiver/amplifier with Bluetooth to play your music from your device, CD and DVD players.